Here we go again with Thursday Tangents. If you’re looking for Wednesday Wanderings, go back one to hear all about the Spaceport Archeologist. Bubonicon, our local SF convention. To clarify, this is not a Tea for the authors, but rather a Tea hosted by the some of the authors. In addition to teas contributed by a local tea room, we provide a massive spread, including sweets, savories, and an assortment of fresh fruit and cheese. Moreover, in many cases, the authors themselves do the baking. Thinking I might vary my usual offerings, I pulled out an English cookbook I was given some years ago. I immediately got stumped. I hope you could help me figure out some of the ingredients. ALAN: I’ll do my best – but I tend to be much more of a consumer than a producer in this area. JANE: Okay. Here’s the first. A recipe for Saffron Buns calls for “strong flour.” Any idea what that is? ALAN: Ah! As it happens I do know the answer to this. Strong flour is specially designed to induce anaphylactic shock in people who are gluten intolerant. It is milled from unbleached wheat and tends to have a brownish colour. It has a hugely high gluten content and is mainly used for baking brown bread. JANE: But isn’t that the same as whole wheat flour? I figured that the “wholemeal” flour mentioned in a couple of recipes fit into the puzzle there. I wonder what the equivalent of “strong flour” is here. Maybe some of the bakers in our readership can help. ALAN: Now I’m lost. 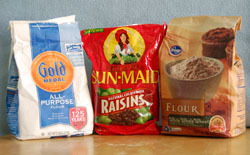 I have no idea whether or not strong flour and whole wheat flour are the same thing. This is definitely one for the readers. JANE: All right, here’s a new one. The same recipe calls for either currants or sultanas. I have baked with currants, but not with sultanas – in fact, I’m not even sure what a sultana is. Let’s see… My dictionary gives a variety of definitions. Since I’m betting the recipe doesn’t want me to include “a female member of a sultan’s family” or an exotic bird, I’m guessing what’s indicated is a raisin made from a pale golden grape. However, raisins start their lives as grapes. So, apparently, do sultanas. ALAN: Ah! We’ve found another linguistic difference; quite a subtle one this time. Your statement about currants puzzled me so much that I actually had to go and look it up on them there interweb thingies. What I found astonished me. According to Wikipedia, in the United Kingdom, Ireland, Australia, New Zealand, and Canada, the word “raisin” is reserved for the dried large dark grape, with “sultana” being a dried large white grape, and “currant” being a dried small Black Corinth grape. Wikipedia insists that Americans (alone in the English speaking world) call these last “Zante currants.” It even has a photograph of a packet of Sun-Maid Natural California Zante Currants to prove it. As far as currants being a fruit that grow on a bush, I’d call those “blackcurrants” or “redcurrants,” but never just currants. Also I don’t recall ever seeing dried blackcurrants, only fresh ones. Perhaps we have another cultural divide here? I have a lovely recipe for pork, cooked with apples, prunes and sage. I make it regularly; Robin and I are both very fond of it and the cats enjoy the off-cuts from the raw pork. ALAN: Have you considered providing a Devonshire Cream Tea? Nowadays you seem to be able to get pale approximations of the real thing almost everywhere you go, but in my youth it was available only in Cornwall and Devon, in the deep southwest of England. We used to spend our annual summer holidays down there and every year we would gorge ourselves. The cream (clotted, or clouted cream) was thick and heavy, often with a slight yellow tinge because it was so full of fat – full of goodness, as my mother used to say. We would spread jam on freshly baked scones, smear thick dollops of cream on top and stuff our faces. It is a hideously unhealthy meal but truly blissful. Can you get proper clotted cream in America? A lot of the settlers in Australia (and to a lesser extent New Zealand) came from the south-west of England and so cream teas are quite common over here. JANE: Whoa! Slow down…. Before I tell you whether or not we can consider a Devonshire Cream Tea, I need to ask, is the only difference the inclusion of clotted cream? ALAN: Yes – it’s just scones and jam with clotted cream. And pots of tea, of course. You simply can’t have tea without tea. JANE: Sounds lovely, but I doubt we could manage a cream tea for Bubonicon. I do believe you can get clotted cream, but whether or not you would consider it “proper” I can’t say. That’s the problem with words – they only go so far. One of my fondest eating memories of my long-ago trip to New Zealand was the morning that I decided to eat “light” and took a selection of fruit and yogurt from the hotel buffet, rather than the meat and egg-oriented meals I’d been eating. The yogurt was, by far, the best I’ve ever had – creamy, rich, and incredibly indulgent. If I’d known about it, I would have skipped all the bacon and other stuff and just eaten that. ALAN: Now I’m puzzled again. Isn’t that what yoghurt is always like? What does yoghurt mean to you? JANE: Uh, oh… I see we’re heading off on another tangent. Let’s save yogurt for another time… And you’re not off the hook for tea items. I haven’t even gotten to the confusion of sugars. JANE: Next time, definitely, next time. This entry was posted on August 18, 2011 at 1:00 am and is filed under Thursday Tangents. You can follow any responses to this entry through the RSS 2.0 feed. You can leave a response, or trackback from your own site. I’ll go all botanical in a second, but I’d speculate that strong flour is something like bread flour, since you need a lot of gluten for bread. Anything you can make whole wheat bread from should be sufficient. There are also currants you eat fresh. They’re in the gooseberry family (Grossulariaceae, whose only genus is Ribes. There’s something deeply odd about this, but only if you’re a botanist). To a botanist, a currant is the fruit of a Ribes species that isn’t covered by prickles. A gooseberry is a Ribes fruit that is covered by prickles. To a grocer, a gooseberry is a Ribes fruit that is NOT covered by prickles, and those prickly things are inedible (actually, they just need to be peeled). And a currant is a dried grape. Now, you may see things that we’re originally called Chinese gooseberries, now marketed as kiwifruit. You may also see little things called Chilean gooseberries which are actually small, sweet tomatillos. The bottom line is that you have to figure your audience. What you buy for your garden or see in the woods (Ribes) isn’t the same as what you see in the market (grapes, Ribes, kiwifruit, or tomatillos). Go “all botanical” all you want… That’s fascinating stuff! In the botanical/naming vein: there’s something about gooseberries that just provokes name confusion. For example: Grossulariaceae. In general, families (ending in -aceae for plants) are named after a genus in the family. For example Poaceae (the grass family) is named after Poa (a large genus which includes the bluegrass most people have in their lawns). However, Grossulariaceae only contains one genus: Ribes. Why aren’t they the Ribeaceae? Well, one or two people have tried it, but that name never caught on. Thing is, the European gooseberry (a currant by the above definition) used to be called Grossularia declinata L. That L means it was named by Linnaeus. (According to the rules, all valid scientific names start with Linnaeus. Any earlier name isn’t valid). Linnaeus also named the genus Ribes. Sometime later, scientists mostly agreed that Grossularia belonged in Ribes. I’m not sure why the Grossulariaceae name stuck, but it did. It’s probably political. Don’t worry about being confused by this. That’s the point: there’s something about gooseberries and currants that just seems to promote confusion. That may be why zante grapes, kiwifruit (which are from China, not New Zealand, and which are not gooseberries despite being called Chinese gooseberries), and tomatillos all pick up either the currant or gooseberry moniker in the grocery store. Go figure. Actually, better yet, go hiking. There are a lot of wild currants and gooseberries in the western US, particularly in the mountains. Most of them are edible (although a few are rare and many need to be peeled). They’re a fun wild berry, and pretty easy to recognize when you’re out hiking. What I want to try is a huckleberry… One of these days! Reasonable approximation for fresh huckleberries: http://www.mad-river-farm.com/catalog-p6.htm#huckelberry. Otherwise, go to the Pacific Northwest, oh, right about now. They’re similar to blueberries. Tried Vanilla Chai tea tonight–tasted weird–yuk! !